Discover health benefits of almonds! Almonds have hard outer shell and a nut inside. They are one of the most nutritious of all nuts, packed with vitamins and nutrients. Almonds can be sweet or bitter. Sweet almonds come in two forms: thin and thick skinned. The thin skinned ones have a higher calorie content than the thick skinned ones. 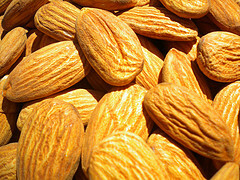 Sweet almonds can be eaten raw, toasted, whole, sliced, ground or powdered. Sprinkle them over salads or other meals. They're used for making almond butter and almond milk. All commercially grown almonds are the sweet variety type. On the country, bitter almonds can not be eaten. They're slightly broader and shorter than the sweet kind. They're used for making perfumes or other cosmetics. Almonds grow on a small deciduous tree in the Mediterranean region of the Middle East. They're sold around the world as shelled or unshelled. The top five almond producing countries are: United States, Spain, Syria, Turkey and Algeria. Mix powdered almonds & orange juice. Relieve coughs & throat infections. Mix one teaspoon of almond oil with 1/2 cup warm milk for indigestion. Grind a handful of almonds in food processor. Add water to make a pasty texture, (not too thick or too runny). Apply paste, evenly, to clean face. Avoid eyes, ears, nose, mouth or other sensitive areas. Leave on 10 to 15 minutes. Wash face with lukewarm water. Gently pat dry. Soak 8 tbsp. of raw almonds in a covered bowl filled with water, overnight. In the morning, peel skins off almonds. Mash almonds to a pasty texture. Add 1 tbsp. of raw honey and 1/2 tsp. lemon juice to almond paste. Blend well. Apply mixture, evenly, to clean face avoiding eyes, ears, nose, mouth or any sensitive areas. Leave on for approx. 15 to 20 minutes. Rinse face, thoroughly, with warm water. Gently pat dry. Peel 1/2 ripe avocado. Mash in mixing bowl. Add 1 tbsp. almond oil to mashed avocado. Blend well until pasty texture. Apply mixture to clean face, evenly, avoiding yes, ears, nose, mouth or any sensitive areas. Leave on for approx. 15 - 20 minutes. Rinse face, thoroughly, with warm water and mild cleanser. Gently pat dry. Add gentle moisturizer, if desired. Use almond oil in your homemade soap recipes! Almond oil has natural emollients. It gives homemade soap a smooth, creamy, lather that moisturizes skin. Almond oil nourishes skin with its rich vitamin content of: vitamin A, B1, B2, B6 and E! It's rich in antioxidants! Combat free radical damage. Almond oil blends well with: chamomile, lavender, geranium, sweet orange, milk and honey. It has a short shelf life of 4 to 6 months. Add 10% wheat germ oil, to dilute, to extend its life. Store in a cool, dark, place or refrigerate. May last up to 6 months if stored properly. Almonds have magnesium, an essential mineral for growing healthy hair. A deficiency in magnesium has been linked to hair loss. 1/4 cup of dry roasted almonds has approx. 45% of the RDA (recommended daily allowance) of magnesium and vitamin E.
ALMOND RECIPE FOR HAIR: Almond oil is a pale yellow oil, extracted from almonds with high amounts of vitamin D and E. Massage a few drops of organic almond oil to the hair or scalp for an inexpensive moisturizer. Apply this oil once a week for healthier hair growth, that is strong and shiny.